The Main Aim of Creating such Rest API Web Service is to share the data between application where we could create apps that can reach a huge peoples! The Specific Application is registered with APP id and Secret key and may be where the origin request is arises and handled. And Action to be perform is passed via Body part with data to be processed. The above steps are basic simple but there are lot of methods to be followed for full Fledged API platform to run with performance. 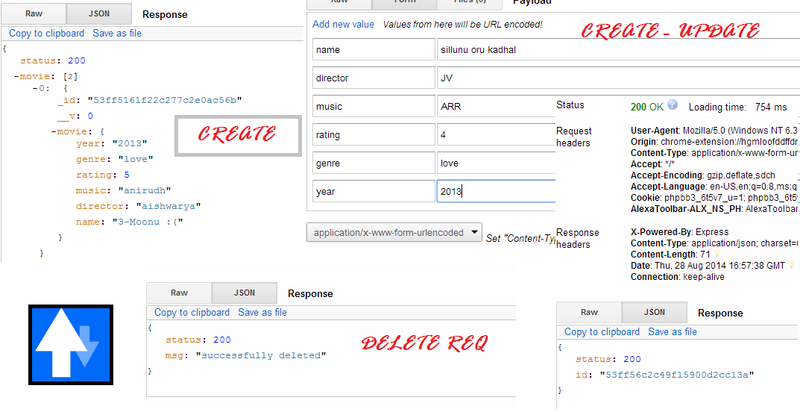 My Application will pull data from Server which is managed by Node.js as Backend Server Responding the Requests! This is just Basic Model Of pulling data from server to display at cross platform application. I haven't enabled any HMAC Security and any other securing features to authenticate. I am using Express Framework 4.x.x version since it is handy for me. I am versioning the API via URL for my easiness.There are lot of controversies in this versioning API via URL/or body part! First of All let me Create a Simple routes that can respond with JSON format data and accepting inputs via body and headers. Since we are going to handle a considerable amount of Data lets have simple schema holding recent film,2014 films and love.horror movies in single schema document with sub-document. and give Database Name , here Database Username/Password is very important. Let me explain the logic of Database query here,Btw we connected to mongoose db with url connect() using the url. PUT /update - this route is used to update a movie by passing _id and necessary details to update.here findbyIdandupdate function is used to find id and update simultaneously. Thus in Above model.js we have defined our database schema and how we are going to organize our data in mongoose database. Download the REST API Client from here. abd have a try. Note : I haven't validated any data from user and retrieve from DB.This is basic app for RESTful Webservice and not suitable for production mode.